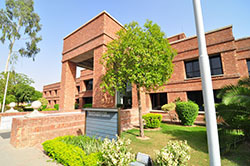 The Business School, established in 1986, was the first of the schools at the Lahore University of Management Sciences (LUMS). The need for a challenging and relevant curriculum suggested the use of case studies rather than conventional lectures to impart knowledge. This decision was supported by close collaboration with Harvard Business School and the University of Western Ontario (UWO), both of which are pioneers in this teaching philosophy. 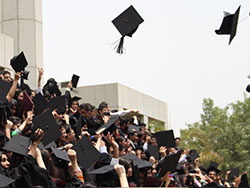 At the same time, the commitment towards academic and professional excellence is supported by a "Visiting Committee", comprising academics and administrators from world-renowned universities and institutions including Harvard, UWO, IMD, Cambridge, Stanford, McGill and the Asian Institute of Management. The school offers a variety of programmes including an intensive full-time MBA, a week-end Executive MBA, a course-based PhD Management and Bachelor's programmes with majors in Accounting and Finance, and Management Science. In addition, the Rausing Executive Development Centre (REDC) offers short duration programmes for executives. The school also carries out rigorous economic and management research through the Strategic Sectors Research Centre, Social Enterprise Development Centre and the Case Research Centre. LUMS maintains a close relationship with the business world, which acts as a source of advice and information. This interaction not only helps to keep the curriculum relevant to the needs of business organisations but also ensures that the students are exposed to the dynamics of the corporate world. Business leaders actively interact with both faculty and students through frequent visits, seminars and as guest speakers and their perspectives enrich the classroom experience. Additionally, industry linkages are strengthened by the involvement of MBA faculty in teaching and training in the executive development programmes that are attended annually by more than 2,000 senior executives and managers from the corporate world. We aim to provide for the varying educational needs of a culturally diverse and geographically dispersed student body by preparing them academically, personally, and professionally, and by providing them access to opportunities to make a difference. Three decades and over 2000 graduates later it is ranked as one of the top business schools in the region. 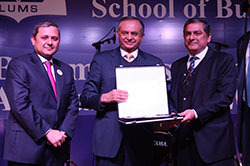 SDSB continues to be the first choice of students in South Asia. This is what makes a partnership with SDSB a worthwhile endeavour. "I joined LUMS in summer of 1991 at the old campus. For our summer orientation among other things, we were introduced to computers and given two floppies each! Coming from a background of traditional classrooms, the case method of teaching felt intimidating. 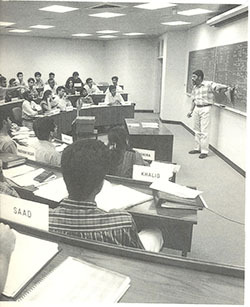 I was fortunate to have been taught by the founding faculty of LUMS, with less than 100 students on the campus. I made lifelong friendships during my time at LUMS. While WAC was a backbreaker the lure of Halwa Puri breakfast kept us going, not to forget the midnight basketball matches. Would not mind doing it all over again!"